Premium Belgian chocolate infused with pure CBD is a great treat and medicine—two in one. This delicious Dark chocolate bar is blended with CBD sourced from 100% organically and ideally grown cannabis plants. Our CBD produced through supercritical CO2 extractions and it contains great CBD levels. 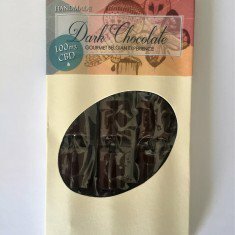 This Dark Chocolate has an awesome taste—nice and strong, but it does not leave an aftertaste of decarboxylated cannabis oil, or any unpleasant one. The CBD Oil used in creating our CBD Dark Chocolate Bar is a dietary supplement and is 100% legal in all of the United States. Ingredients (All natural): Semisweet Chocolate (Unsweetened Chocolate, Sugar, Cocoa Butter, Sunflower Lecithin, Potassium Carbonate, Vanilla), Natural Flavors, Cannabis. *Allergy Warning: This product may contain traces of Nuts and Milk. Dark Chocolate Bar is my favorite!! And the CBD really works, so tasty!!! !